The Goddess of the Underworld is also known as Proserpina and she is the daughter of Zeus and Demeter. The symbols of her are bats, pomegranate, seeds of grain and deer––+. The Greek world was divided into three different parts. The first is Hecate, the moon goddess, who wandered through the sky. The second is Demeter, who rules the surface of the earth, and the third is the queen of the afterlife, Persephone. Now, how did Persephone become the queen of the underworld? She was abducted by her uncle, Hades. One day, Persephone was picking flowers when the chariot of hades appeared and the god of death took her through a crack in the earth, which immediately closed after them. Her mother went searching for her, and with each step she took all agricultural ground turned to desert and stopped all growth. To restore the natural order, Zeus arranges his daughters release by negotiating a settlement between Demeter and Hades. But, Persephone had already eaten a pomegranate seed, which causes a living person to be able to exist in the underworld but never fully being allowed back into the world of the living. So, because of this Persephone is compelled to spend her time between both lands. While Persephone is in the land of the living, her mother Demeter is happy and allows everything to blossom again (spring) but, when she is forced to go back to the underworld, Demeter’s sadness causes everything to wither and die (winter). Even though Persephone is torn between these worlds and was in a difficult spot she accepted her role and life and still lives a gracious and gentle queen of the underworld. She is the queen of the underworld, springtime, vegetation and maidenhood. The mysteries of Eleusis were devoted to the ‘Two Goddesses,’ Demeter the grain goddess and her daughter Persephone, locally called Pherephatta or just ‘the Maiden,’ Kore. These mysteries were organized by the polis of Athens and supervised by the archon basileus, the ‘king.’ For the Athenians these were the Mysteries tout court, and the literary prestige of Athens that ensured their lasting fame. Inscriptions and excavations in addition to literature and iconography provide abundant documentation. The well-known myth depicts Demeter searching for Kore, who has been carried off by Hades, the god of the netherworld. Kore finally comes back, if only for a limited period, to Eleusis itself; there the Athenians celebrated the great autumn festival, the Mysteria; the procession went from Athens to Eleusis and culminated in a nocturnal celebration in the Hall of Initiations, the Telesterion, capable of holding thousands of initiates, where the hierophant revealed “the holy things.” There were two gifts that Demeter bestowed on Eleusis: grain as the basis of civilized life, and the mysteries that held the promise of ‘better hopes’ for a happy afterlife. These mysteries took place exclusively at Eleusis and nowhere else. [AMC, pp. 93-4): We have only some piecemeal information about the details of mystery initiations, which, although it does not add up to form a satisfactory picture, still strikes the imagination with the charm of the fragmentary. For Eleusis we have at least five sets of divergent evidence: the topography of the sanctuary; the myth of Demeter’s advent, as told especially in the Homeric hymn, a relief frieze with initiation scenes, known in several replicas; the synthema, “password,” as transmitted by Clement of Alexandria; and the two testimonies of the Naassene, which clearly pertain to the concluding festival. “Those who wish to be initiated have the custom, I believe, to turn first to the ‘father’ of the sacred rites, to map out what preparations have to be made.” (Burkert, p. 11). The Mysteries should not be regarded as religions per se; they were rather an optional activity within polytheistic religion, “comparable to, say, a pilgrimage to Santiago di Compostela within the Christian system.” (Burkert, p. 10). “Demeter, the story goes, when received at Eleusis, took the little child of the queen and put it in the fire of the hearth at night in order to make it immortal. Interrupted by the frightened mother, she revealed herself and installed the mysteries instead.” (Ibid, p. 20). The link between the two is underlined by the initiation of a “child from the hearth” at each festival. (p. 52). Later Christian charges that the kiste contained a phallus could be a case of taking the pestle for a phallus, which it resembles. Or perhaps a phallus was used as a pestle. In classical antiquity the identity of a child was believed to come exclusively from the male seed, with the mother only providing the fertile bed for the foetus’ growth. This would place added religious emphasis on the phallus as the source of new life. Another source mentions that such songs had as their aim the keeping away of spirits of infertility, for, as everyone knows, they are great prudes. The gates were open to the mystai. We know that immediately beyond the entrance there is a grotto…It was dedicated to Pluto…whom the mystai thus approached. The celebration proper took place in the Telesterion…built to hold several thousand people at a time, watching as the hierophant showed the sacred things…In the centre was the Anaktoron, a rectangular, oblong, stone construction, with a door at the end of one of its longer sides; there the throne of the hierophant was placed. He alone might pass through the door into the interior of this building…The great fire under which the hierophant would officiate…burned o the roof of the Anaktoron…the roof of the Telesterion had a kind of skylight…as an outlet for the smoke. (Burkert, AMC, 75): “The grief of Demeter ends with the return of Persephone, and ‘the festival ends with exaltation and the brandishing of torches.’ (Lactantius). known but the beginning is assumed to be Spring; a season of rebirth and new beginnings. to be a part of it. The newborn animals begin to learn how to survive and become adults. is good, at times it’s bad. Following summer comes Fall; a season of change and preparation. air is bitingly cold and so very dry, the snow piles up, the ice is slippery and dangerous. 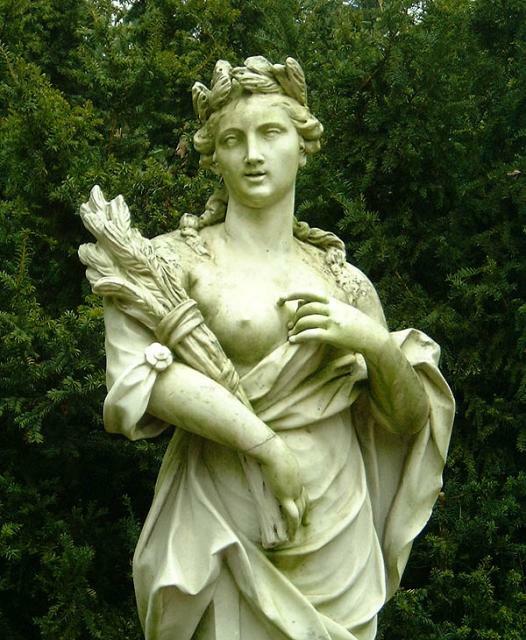 Ceres in Roman mythology) is the goddess of agriculture, nuturing, fertility, and grains. nursemaid after a long depressed state, and decided to make a future king immortal. started to become barren and all harvests ceased. It became a never ending winter. 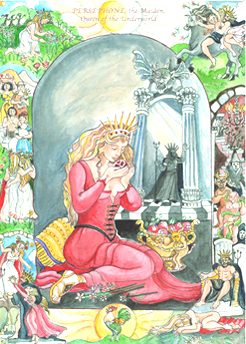 Persephone leaves her mother and Winter; the time Demeter is without Persephone. no matter what is going on and how bad things get. The leaves are falling, and the birds are chirping about, harvesting food for the chilly months ahead. The smell of spices are in the air, and pumpkins are being carved. These are all some of the feelings of fall. With these feelings are the goddesses associated with autumn, or as some people may call Harvest. 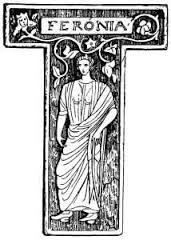 Demeter is one of the many goddesses with autumn ties. She is the Greek goddess of the harvesting times and has a very nurturing spirit. She has been known to be very giving towards mankind, granting them crops to plow, and grain to save. With that mothering soul of hers she had her daughter Persephone, who is known as the queen of the underworld. Most of you may know the story of Persephone and Demeter, but for those who don’t, it all started with Hades. Hades couldn’t help but fall in love with Persephone. So one day when Persephone was picking a flower the earth opened up, and up rose Hades strong arm, and pulled Persephone right down to the underworld with him. 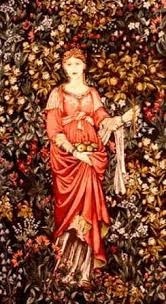 Having heard Persephone’s scream, Demeter ran to the meadow where Persephone was. Persephone was nowhere to be found. Demeter instantly lit her torch and set out on her search to look everywhere she could possibly think of. Finally, Demeter encountered Helio, the sun goddess, who told her that Persephone was now Hades wife and queen of the underworld. So stricken with grief, Demeter withdrew her divine duties as being provider of the land and sentenced the earth to be bare until her daughter was brought back to her. The earth saw a winter that was never ending. Zeus, Demeter’s husband, finally opened his eyes to all the starvation that was going on in the world and eventually gave in to Demeter and sent Hermes to tell Hades to bring Persephone back. Persephone was delighted to here of her mothers longing, and agreed to return. But just as she was about to leave, Hades offered her a pomegranate. Persephone knew to never eat anything in the underworld, but she was so hungry from not eating for so long she decided to eat just the seeds. Demeter was not at all happy upon hearing that Persephone ate the seeds, and told her that she would have to return to the underworld for four months out of each year. 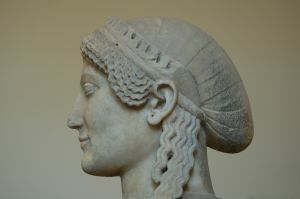 Otherwise, Demeter was very content and resumed her goddess duties. Because Demeter is such a loving, motherly goddess, I’m sure she would love to connect with anyone who has a kind heart. You could try writing a letter of things you wish to cultivate in the coming harvest, and burying it in the ground. The Divine Goddesses are always willing to listen and defiantly want to help. Demeter would be happy to help you harvest your desires this fall and remind you of your mothering flame as well. The rich scent of soil works its way into my nostrils. The earth fills my hands like fine cloth, smooth & heavy. I let it drift through my fingers as I marvel in its texture. This garden is mine, as is the brand new house that goes with it. In both the literal & figurative sense, I have worked hard to plant the right seeds & asked my Gods to help them to thrive. In this season of harvest I find myself looking forward to sitting back & enjoying the fruits of my labour, to reap the rewards of what I have sewn. I would like to give thanks, but who should I pray to? 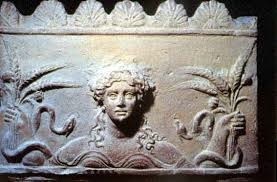 My thoughts turn automatically to Demeter. Beyond the rough concept of a goddess of grain & growing things, who was she? She was a child of the Titans Cronus & Rhea, & therefore a sister of Olympian Zeus. Her very name meaning ‘grain mother’, Demeter ruled over the areas of agriculture, fruit & vegetables, grain, fertility, & health. 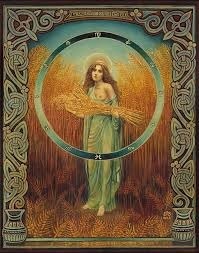 In the past Demeter’s sacred days revolved around harvest-time. 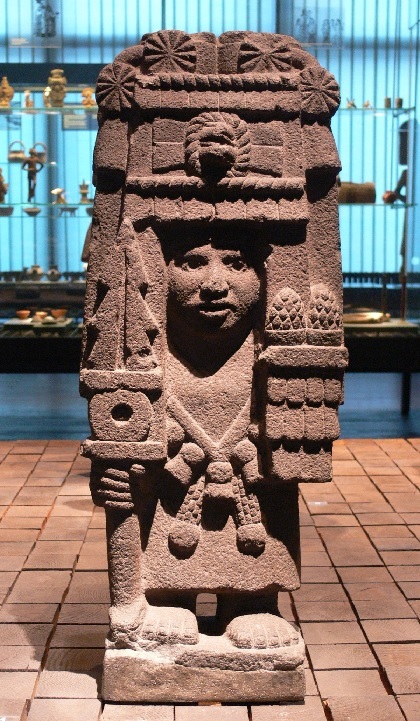 Her most important festival was held every 5 years for 9 days, & included processions, sacrifices, & song. 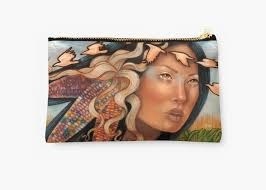 The goddess has long been associated with the changing of seasons, as well. Demeter treasured her daughter Persephone above all things. The girl’s beauty captured the attention of the lord of the underworld. One version of myth told how Zeus sought to please his brother Hades & gave his permission to seize her. When her daughter Persephone was abducted, her grief consumed her attention. She no longer cared for her duties, but without her attention famine threatened all. No green or living thing could grow in the chill of her sorrow; winter would not cease. Perhaps she felt Zeus. In her hurt & anger she allowed the earth to go barren until her daughter was restored to her. The full weight of what he bought into motion struck him hard. The king of Olympus sent messenger Hermes to tell his brother to release Persephone. Outwardly Hades agreed, but not before offering her a pomegranate to snack on. Anyone who ate the food of the underworld must remain there. Eventually a deal was made. The deed could not be undone; Persephone ate of the seeds. However the blow was softened. The girl would only be required to spend part of her year down below. In those months Demeter’s grief would cause the land to wither. 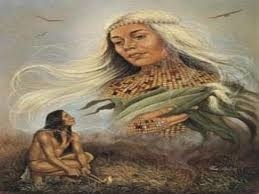 In the months she spent above with her mother, the goddess’s joy caused the earth to flourish & be reborn. Was she a vengeful goddess? Maybe. Although it’s perhaps more correct to say she was a passionate deity lead by her heart. Consider the case of Celeus. During her time wandering the earth as she grieved, Demeter came to the court of Eleusis & gained employment nursing the king’s sons. At one point the elder son accused Demeter of being greedy & she turned him into a lizard in response. Perhaps she felt a little bad about her hasty act. The goddess, as much to honour Celeus for his hospitality as make up for her hasty act, decided to change one of the remaining boys into an immortal. Each night she tried to burn away Demophon’s mortal spirit by anointing him with ambrosia & placing him in the hearthfire, until his mother saw what was happening. Her frightened antics angered Demeter, but the goddess persisted. Instead of making his brother immortal, she chose to teach her knowledge of agriculture to Triptolemus instead. From him all of Greece learned these arts. From Demeter we learn that the only thing eternal is the Wheel of the Year itself. Seasons change, winter eventually fades. Sorrow becomes rejoicing. From her we learn that tending the earth is hard work but not without reward. Your efforts will yield fruit in the right season. Let her lessons be seeds to plant deep down within & flourish in your soil. It happens every year; the warmer seasons fade to autumns docile colors and temperatures that soon bow to winter’s howling nipping winds. Reminding us that Persephone is starting her journey to the underworld to be with Hades; causing her mother Demeter to grieve and the earth lose her luster of spring and summer. It is said that the reason for the colder months is just the anguish of an ill-be-gotten mother whose daughter was taken from “under her nose”. The story goes as such; Hades; lord of the underworld; had fallen in love with Persephone; daughter of Zeus and Demeter; and had asked Zeus for her hand. Zeus fearing Demeter’s reaction told Hades that he may not have it. Hades then decided that he loved Persephone so much that he couldn’t live with out her and on day decided to whisk her away to the underworld, by thrusting through a cleft in the earth and grabbing her as she picked flowers with some nymphs. Demeter being distraught with grief and anger punished the nymphs for not assisting her daughter in her time of need; by transforming them into the sirens we know today. But that was not all she had also stopped tending to the plants and spent her time searching the world for her beloved daughter, when Helios; the sun who sees all; told her what had happened. Zeus; under pressure from Demeter and the starving peoples of the earth; demanded that Hades return Persephone to her mother. Hades refused; causing Zeus to exercise his power and authority with his brother decreed that their marriage be null and void as long as Persephone ate nothing of the Underworld’s food. Starving Persephone gave to Hades’ temptations with a pomegranate, and consumed a few seeds thus causing her marriage to Hades to be consummated in the eyes of the Olympians. Waiting until Demeter and her daughter were once again united; Ascalaphus informed the other gods that Persephone had eaten the pomegranate seeds. But it was the Fates rule that no one who had eaten from the gardens of the underworld would be aloud to return, and to save the peoples of the Earth Zeus, Hades, and Demeter made a deal. Persephone was to spend half of the year with her mother, and the other half of the year with Hades as queen of the underworld. Her return from the underworld marks the beginning of spring, summer is the time that Persephone and her mother get to spend together, her journey back brings the beginning of autumn, and winter is marked by the number of pomegranate seeds that Persephone had consumed. So it is believed that autumn and winter are a form of a mother‘s grief of a “lost” child. Thus reminding us that there is greater meaning to what we see as trivial things and the reasoning behind the season changes. August is the height of late summer. 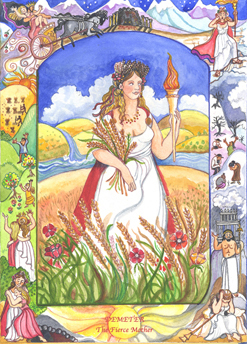 That is why, in the central image of this painting, we see Demeter, a gloriously fruitful goddess, bearing golden sheaves of wheat against a background of blazing summer skies, poppies, and flowing rivers. Everything symbolizes the fertility and abundance she showers on a hungry world. How beautiful she is! In her left hand, however, she bears a torch. And vignettes that tell a less sunny story surround her. It is that story that has earned her second title, The Fierce Mother. That is the story I tell today. Demeter, provider and mother figure for the whole world, had only one child, a daughter named Persephone. This lovely girl was her pride and joy. While busy with her great task of making the Earth fruitful, Demeter took satisfaction in knowing that her ceaseless labors of love allowed her precious child to be carefree. Persephone could, and did, spend her days dancing in the meadows with her friends, gathering flowers that her mother had nurtured and brought to the peak of perfection. She led an idyllic life! Then one day, the unthinkable happened. Hades, the lonely King of the Underworld, kidnapped Persephone and took her to his dark kingdom. There, he raped her, and forced her to marry him. All with the collusion of Zeus, King of the Gods, Persephone’s father, and Demeter’s brother! Demeter was devastated. Taking a torch in her hand, she searched tirelessly for her lost child in every nook and cranny of the Earth. But nobody could tell her where Persephone had gone. She sank into a grief so profound that she abandoned her care for the world. Crops failed. Animals died. Blasted by famine, drought and winter, people died as well. Their cries for help to Mother Demeter went unanswered. When Demeter finally discovered that Hades had stolen Persephone, she was outraged and demanded that Zeus force Hades to return her. Conditions on Earth had become so dire that Zeus had to take action. He ordered Hades to restore Persephone to her mother. But Hades claimed the unhappy girl had just broken her fast by eating seven seeds of a pomegranate – a symbol of marriage in the ancient world. As his wife, she was obliged to remain with him forever. Zeus made a canny compromise. Persephone would spend 8 months of every year with her mother on Earth. She would return to the Underworld with her husband for only 4 months – after harvest! I honor the great Goddess of Abundance and Fertility. But I am inspired by her example as Fierce Mother. What mother has not had the experience of having to go look for their child? Of fighting to retrieve them from some danger? It may begin early with a terrifying, momentary loss of a youngster in a grocery store. As they grow older, and life becomes complex, the losses may become more challenging. I know mothers who have fought fiercely to extricate a lost child from the grip of an addiction. Others have sought to rescue a beloved child from depression, a painful marriage or loss of a partner, financial losses, or eating disorders. At the moment, I, and my family, are facing a life-threatening illness in a cherished son. At such times, the model of Demeter, Goddess of Agriculture and Abundance, and Fierce Mother, is good to remember. Demeter refused to abandon the quest to restore her daughter to Life. Her persistence succeeded. Persephone WAS returned to Earth, though she was not the same carefree child she was before her descent into Underworld. Both mother and daughter were transformed by their experience of loss. Persephone grew up. Demeter discovered untapped resources of strength as well as abundant provision. For now, have a blessed August.